All of the content on AirSafe.com and on AirSafe.com-related online resources exist there for the benefit of the traveling public. In order to promote greater public awareness of airline safety and airline travel issues, AirSafe.com allows anyone to use most AirSafe.com material without limitation. Typical ways that you can reuse the material include web sites, blogs, newsletters, audio or video productions, books, or research reports. There are a number of online and offline resources where the copyright is owned or controlled by AirSafe.com creator Dr. Todd Curtis, or by AirSafe.com, LLC. These properties include AirSafe.com, AirSafeNews.com, AirSafe-Media.com, FlightsGoneBad.com, Plane-Crash-Videos.net, BirdSrikeNews.com, the Conversation at AirSafe.com podcast (including the videos at AirSafe.com's YouTube Channel, and the Todd Curtis books Understanding Aviation Safety Data and Parenting and the Internet. Facts such as dates, locations of accidents, and other raw data can be freely used without limitation. Also, there are also no limitations on basic ideas that are described in the various online resources, for example the mathematical formulas used to determine fatal event rates. 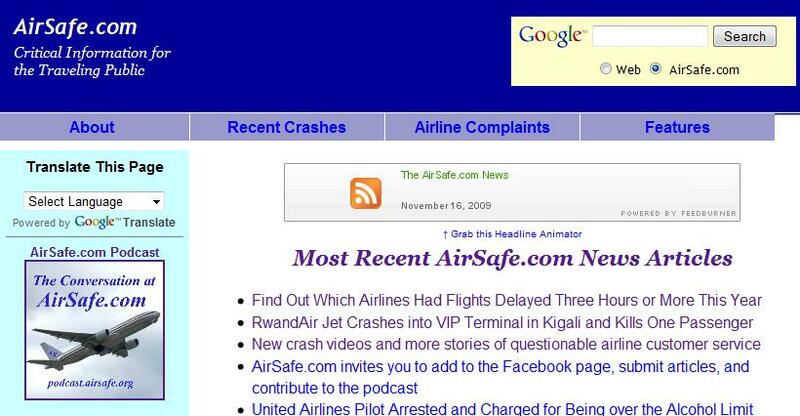 Any written or multimedia content on an AirSafe.com-related resource can be reprinted or reused for non-commercial use in a web site, newsletter, blog, or other publication so long as no substantial changes are made in the text and if credit for the source of the material is included. That credit should state credit and URL is included: Dr. Todd Curtis AirSafe.com http://www.airsafe.com. If you use complete video or audio programs, they already have AirSafe.com copyright information included, so no further notification is needed. However, please identify the source if you only reuse a portion of an AirSafe.com-related video or audio program. You can find links to all AirSafe.com audio and video files at podcast.airsafe.org. If you want to use AirSafe.com related material for some commercial or for-profit use, please contact AirSafe.com for permission. The copyrights to some the photographic and video content within an AirSafe.com-related resource are not controlled by AirSafe.com. If you are unsure of who owns the copyright, either don't use the material or contact AirSafe.com for guidance. Please review the disclaimer statement on the AirSafe.com web site for other key limitations. This disclaimer statement applies to all AirSafe.com-related material.